Today marks the first anniversary of my blog, Life as a Widower. It has been a year since I published the inaugural post and as coincidence would have it I can also confirm that, twelve months on, the site has now received a million hits. I wrote that last sentence with a little chuckle, recalling my career in PR. Had this been a client’s website I would probably have received a phone call about a week ago asking how we might celebrate their company’s achievements. I would most likely have been asked whether or not I thought their milestones were “newsworthy”, as they grew increasingly enthusiastic about securing a national news story. In their excitement someone at their end would no doubt have had the idea of creating a giant birthday cake in the shape of the company’s logo, which would provide a “fantastic picture opportunity” to accompany the story. I imagine they could picture the company’s chief executive standing next to it and blowing out the candle. In my keenness not to upset my client or undermine their achievements, I would have had to resist the urge to say that sending oneself baked goods in one’s own image as a means of celebration was somewhat disconcerting and perhaps straying a touch too close to vainglorious for comfort or credibility. I would silently remind myself that no one likes a smart-arse and that the skill of client management lies not in being unhelpfully critical, but in offering insight and a constructive point of view. In PR specifically it is also often about trying to identify an angle for a story that it is of interest, not just to people who work for your client’s company but to the wider world. On the face it there’s no need for me to publish a post about the blog ‘turning one’ today; I mean who really cares? And perhaps it doesn’t actually matter if the site has received one million or one thousand hits if it has been able to reach the right people and achieve what it set out to. What does matter to me, though, is that a year ago I didn’t think that anyone wanted to hear a widowed man share his grief. I didn’t have anyone around who really understood what I was going through; I had no access to people living through similar tragedies. And I couldn’t have imagined that launching a blog as a means of finding support for myself would turn out to be of support to so many other people too. I suppose what I’m trying to say is that while naval-gazing about statistics and ‘birthdays’ doesn’t particularly interest me, the idea that there actually are so many people out there willing to listen to those who have lost, when it’s so easy to believe that there are none, really does. And so that’s my angle for today’s post, which I share in the hope that its message can offer some reassurance to those who find themselves in a similar position to me this time last year. Since then I’ve been proven wrong and I have been shown so much support, for which I’d like to say thank you. Here’s to another year of helping one another through the pain of grief. Last week I received an email from JustGiving, the world’s leading platform for charity giving, to inform me that my JustGiving page was one of the most successful of 2013, featuring in the country’s top one per cent. That’s all thanks to the incredibly kind donations of my family, friends and followers of this blog, and I’d like to take this opportunity to express my gratitude from the bottom of my heart. 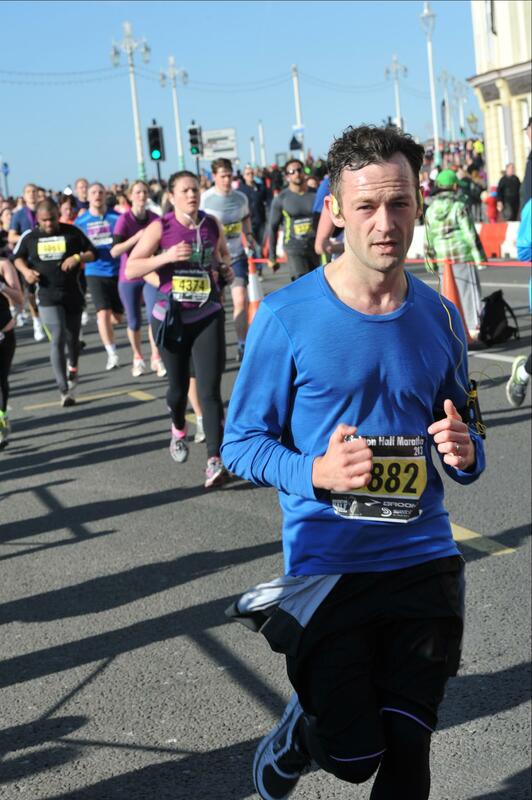 In the next four months I will be running to raise funds for two child bereavement charities. I’ll take part in the Brighton Half Marathon for Winston’s Wish in February and the London Marathon for Grief Encounter in April. If you would like to make a donation to either race please click on the name of the charity you wish to support above. Thanks again. Wow – these statistics are tangible proof that you are making a difference in so many ways. Wonderful. What an incredible journey leading to an equally incredible achievement for you AND all the people you’ve supported during this last year. Supporting you is easy as you are so open and honest in your approach! THANK YOU for sharing yet again and GOOD LUCK with the two races – you will be amazing and your wife will be with you all the way ensuring you make yourself, your wonderful boy and her proud! What an incredible journey leading to an equally incredible achievement for you and all the people you’ve supported over the last 12 months! Supporting you is “easy” as you are so open and honest in your approach. THANK YOU for sharing yet again and GOOD LUCK with the two races – your wife will be with you all the way to ensure you will make yourself, your wonderful little boy and her proud. I hope to meet you one day Ben. This entry was posted on January 6, 2014 by Ben Brooks-Dutton and tagged bereavement, first anniversary, grief, Grief Encounter, life as a widower, lifeasawidower, loss, one year, widow, Winston's Wish.